Upon browsing through years and years of unedited film and photographs that have never seen the light of day, I decided it was time to publish them. And then, the birth of this blog; a sacred space for me on the vast world wide web that isn't the commodity of Facebook, where I can share my life in words and photographs. My photographic portfolio is full of conceptual projects that I pursue, but much of the joy I find within photography comes from casually photographing the people I surround myself with. It is another dimension of my work. These people whom I love to photograph are not professional models, but are people who bring beauty into my life for one reason or another. I photograph them to eternalize all their greatness in the moments we are together. 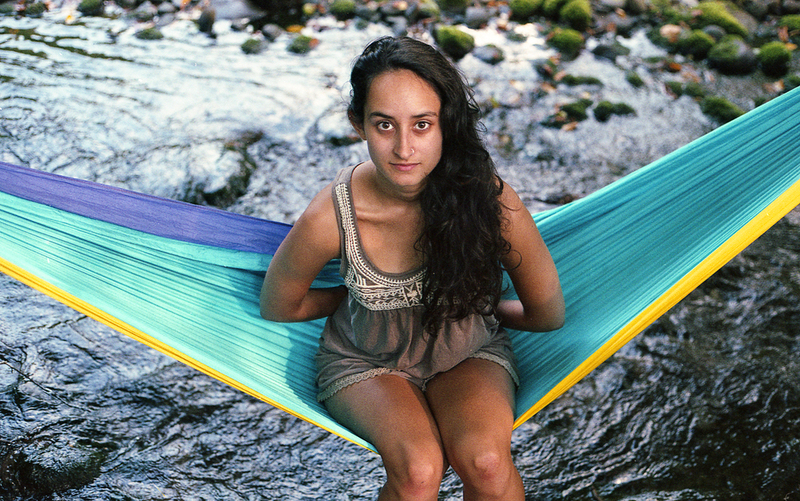 These photographs are from a camping trip in the Catskill Mountains where we all spent the weekend hiking, swimming in icy cold mountain rivers, making music, daydreaming and rolling around in the dirt. These photos are more PROOF that Brooklynites do like fresh air. At the end of the trip, Layla ripped open her foot in the middle of the night on a rogue piece of glass and had to drive to the nearest hospital which was miles away to get her foot stitched up, but fear not, she is now *fully recovered and very mobile once again*. Note: The photo of me was taken by Layla. Check out her dope artwork here.